Tay Bridge disaster, Scotland, 28 December 1879. 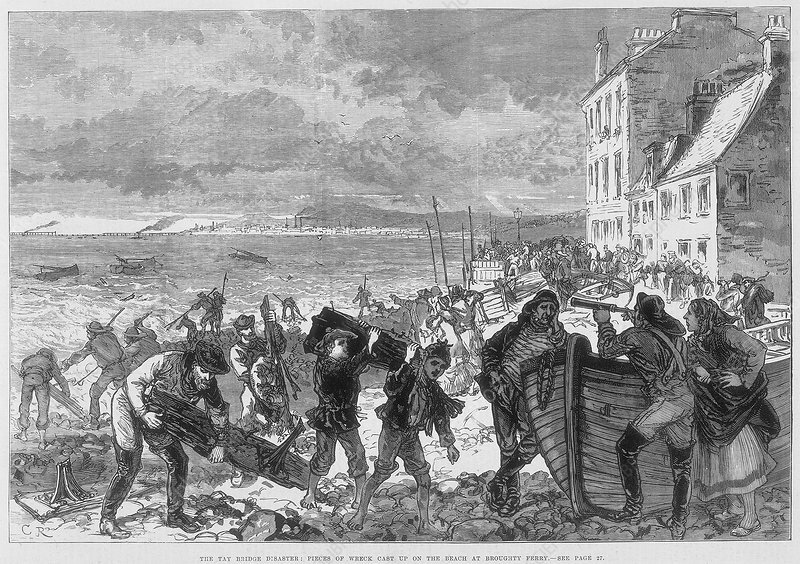 Illustration taken from the Illustrated London News, (3 January 1880), entitled 'Pieces of wreck cast up on the beach at Broughty Ferry'. Designed by the engineer Thomas Bouch and completed in 1878, the Tay Bridge was just under two miles in length and was considered the longest bridge in the world. However, it proved lacking in stability against wind loadings. On 28 December 1879, as the Edinburgh to Dundee train was crossing the bridge during strong gales, the structure collapsed, killing all 75 passengers. Artist: CR.